This is one of my favorite projects. I have one of these blankets in my living room, my mom has one in her television room, and I gave one to my cousin for her wedding this summer. It’s certainly a bit more involved than the last several days of tutorial projects that I have shared, but it makes for such a lovely finished project and is so easy to customize for anyone on your gift list (or yourself!). Sweater selection – Here’s where you can really make the project fit your unique aesthetic by the sweaters that you select. I’ve sewn blankets made from sweaters of just about every fiber content and texture, so don’t worry about picking natural fibers versus synthetics. Don’t pick sweaters that are matchy-matchy. Once you put together the patchwork, it will be more visually appealing if there is some contrast between the sweaters. This can come from color, texture, or fiber content. 4 sweaters will make a nice size snuggly blanket for one person. 3 sweaters will make a lap blanket. 5 sweaters will fit you and your sweetie. Note about sewing: I sew with a ½” seam allowance. If you’re more comfortable with a 5/8″ that’s fine too. I strongly suggest using a stretch stitch throughout. The stretch stitch will make the blanket sturdier and prevent the seams from ripping with use. First, wash your sweaters. Wash them on hot and dry them on hot. This will get all of the shrinking that the sweaters might do out of the way so you don’t have to worry about washing your finished blanket. Wind a few bobbins. I always wind several at the start of the project because I know that it will take a few and then I don’t have to stop sewing to wind another. Cut your sweaters apart. I start by cutting off sleeves, collars and button bands. Then cut off all of the seams. It’s ok to leave ribbing on, it will just add more visual interest. Now, chop the sweater into rectangles. Don’t make the rectangles too small, you can always cut them down further. I try and keep at least one side 5” wide. Lay out your rectangles across the floor as if it will be your finished blanket. (Warn your boyfriend to stay out of the office for a while and kick out your cats so they don’t play in the middle and push your layout everywhere!) It’s okay if they don’t make an even line at the edges of the blanket because you can trim the edges after sewing. Start sewing the blanket together. I find it easiest to sew together in strips or chunks and then to piece the chunks together into the whole. Your rectangles are very stretchy and it’s easy to fudge to get things to fit, so don’t stress about lining things up perfectly. Once you have the top all pieced together, trim your edges even and run it through the dryer. Trust me on this one. It will help tame all the little fluffies that I’m sure you’ve noticed flying around your sewing space by this point in time. You can vacuum at this point too. Now, measure the length and width of your blanket and cut a piece of backing fabric the same size. Depending on the width of your blanket, you may need to sew two pieces of backing fabric together to fit. It’s just fine to have a seam in the finished back. I’ve tried several different types of fabric for the back and found that they all work, you just get a different character. I’ve used t-shirt stretch-cotton, a woven cotton muslin, and a pair of synthetic curtains. I found curtains to be a great backing because they are often wide enough you don’t have to piece them together. Lay your blanket and backing together on the floor, right sides together. Align one side and pin all the way down, every couple of inches. This is really important because the blanket top will stretch so easily. Repeat this for all sides, leaving a 12” gap along the fourth side. Trim the corners and turn the blanket right side out through the gap. Pin the gap as if it had been sewn closed (tucking ½” seam inside) and topstitch right next to the edge to close it. Now topstitch all along the blanket 1/2” in from the edge. Please note: I am not doing any custom sewing at the moment so I am unable to sew a blanket for you. Thanks. The last part about sewing the edge is a little unclear for me. Thank you for putting this tutorial together…I start washing my sweaters today!! The final step is to sew around the entire blanket 1/2″ in from the edge. This sews the top and bottom together so that as you use the blanket, the top and bottom stay in the correct orientation to each other. Hope that helps a bit! A friend of mine just died. Her father and daughter would like to make a blanket for each of them from her sweaters. Would you be able to do this for them? What do you charge? The father lives in Florida and the daughter lives in California. I’m so sorry to hear of your loss. I have sent you an email follow-up. How do you remove the pins after sewing? Wouldn’t they be on the inside? After sewing the right sides of the blanket and backing together (but leaving a small gap), you remove all the pins. Then you turn the blanket right side out and sew the final seam as a topstitch around the whole edge of the blanket. Hope that helps! What a great idea! Thanks for the instructions. I’ve got my sweaters together and am about ready to start! When you stitch your squares together, what kind of stitch do you use to keep the sweaters from unraveling? Do you use a straight stitch or a zig-zag? Thank you for sharing. I usually use my machine’s straight stretch stitch (also known as a lightning stitch) since it’s one of the sturdiest stitches and it has stretch in it. A zig-zag stitch will also work. Don’t use a straight stitch because you will find seams snapping as your blanket stretches around with use. Thank you for your quick response! I’m so anxious to get started. My Amazing cousin Julie sent me your link. My mom passed away a few weeks ago and she had 100+ cashmere sweaters. I want to make blankets out of her cashmere sweaters and your instructions are the easy and clear. Have you worked with cashmere sweaters? One tutorial said I should machine was and dry the sweaters. I’ve never machine washed cashmere and am nervous. What do you recommend? What a lovely idea to make a keepsake and cuddly blanket from sweaters that were your mom’s. How nice to honor and remember her as you sew and use the blanket. I’m very sorry for your loss. I have used cashmere sweaters. I do recommend washing and drying the sweaters before you use them. They will most likely shrink (some or a lot) but by getting the shrinking out of the way first, you don’t have to worry about washing the blanket as you use it in the future. Think of them as material and not sweaters! Thank you for your help and kind words. The gentle reminder that this is material not sweaters was greatly needed Six loads of wash later, I’m ready to start cutting. Hi! My father passed away five months ago, and I came across your link. Is there anyway that I could ship you my sweaters, and you would be able to make something for me? I have asked all the sewers I know, and they do not feel comfortable doing it with the sweater material. I’m so sorry to hear of your loss. I’ve sent you an email with more information. I am excited to create a sweater blanket also! Great instructions. Do you tie the blanket or stitch it so there is no movement with the front and back sides? I know my grandma used to do that when she made quilts. Thank you in advance! I haven’t tied or quilted the blankets in any way. I find that the stitching around the edge is enough to keep the blanket together since I’m making lap size quilts. If you want to make it much larger, you might want to secure the layers together. I personally would use the international stitch to tack the front and back together (but this is because I don’t like the tails left by hand-tied quilts). This website has a great explanation: http://www.fabric-mill.com/blind-stitch_ep_44-1.html Good luck! from those sweaters and a blanket would be a great use for his worn and beloved sweaters. I feel that way I can feel closer to him. Do you yourself make sweater blankets for people? If you did, I would cherish it forever. I’m so sorry to hear of your loss. My thoughts are with you and your family. That’s a really lovely idea to have a blanket made from his sweaters. I don’t do custom sewing at the moment, but I will email you with the contact information of a woman that I know who does. What stitch length is best? Is a polyester thread good or should I use another type? Thank you for posting this great tutorial. Stitch length depends a bit on the weight of the sweaters you are using and your personal sewing machine. A slightly longer stitch length will make it easier to sew through thick layers, but the shorter the seam length the sturdier the seam is, so it’s a balance. I suggest practicing on some scraps. See what sews easiest and then yank and pull on the samples and send them through the washing machine to make sure that the seam is sturdy. Standard polyester thread is fine. My sister passed away and my niece sent me a bunch of clothes to make a keepsake quilt. When I got the package I found most of them were sweaters of different weights (does that matter). I am scared to death to cut them up and get started, also enclosed were a couple of t-shirts and cotton tops. I am assuming that it would be difficult to mix those fabrics. I am very experienced with quilting as I worked in a fabric store for many years, but this makes me nervous, knowing these were my sisters. I was thinking that after sewing the seams I could serge them to finish the seams to help with fraying. Also do you tie the quilt to keep the backing, batting and top together? I’m so sorry to hear of your loss. Using sweaters of somewhat different weights isn’t an issue, although I would keep super bulky and laceweights out of the mix. I would suggest doing something separate with the t-shirts and cotton tops as they will both sew and wear differently. You can serge the seams after sewing, although I have found that I have never needed to as long as I use a very sturdy stitch or a couple lines of stitching. The raw edges are hidden on the inside of the blanket (like a typical quilt you are used to sewing) so they shouldn’t be too much of a concern. If you are worried, you can sew together scraps and then run them through the washing machine and yank on pull on them to see how the seams wear. I do not tie the quilt as I am usually making lap size quilts, although you certainly can tie them if you would like. I do sew around the edges of the quilt to keep it from shifting. I do not use batting as the sweaters themselves provide enough bulk, warmth, and loft. I want to try this with some old sweaters – 3 have quite a bit of cabling. Is there a special needle I should use in my machine? I would probably recommend using a needle on the heavy end (even a denim needle). It will depend upon your machine and the sweaters that you are using what works best, so definitely practice on some scraps. But a heavy needle will be able to handle the bulk of sweaters with cabling. I am so excited about this project and was thinking of turning this into more of a baby blanket. I thought it would make a great shower gift. Do you have a suggestion on how many sweaters would work best? Could a sturdy/printed flannel material be used as the backing? Thank you as I used to sew a long time ago and am trying to reorient myself to the craft. The number of sweaters really depends upon how large they are and whether you can get fabric out of the sleeves or just the body. But I would think you could make a baby size blanket out of just a couple sweaters. A flannel backing should work just fine and would be a great snuggly option for a baby! I recently bought sweaters for $1 at a thrift store with the intent to make a blanket. I was wondering whether while cutting the squares the sweater would unravel therefore using a muslin backing for each square would help keep it’s shape. After sewing the squares together I would use fleece for backing. What are your thoughts about using the muslin? I’ve never found that I needed to back the sweaters before sewing them together. I wash the sweaters on hot before using them, so anything with wool will felt and therefore won’t unravel. For anything else, I suppose if you were to be handling the squares/rectangles a whole bunch you might need to worry, but I generally lay them out on the floor as I go and then pick them up only to do a tiny bit of re-arranging and then sew them together. You’re generally going to want to avoid a very loosely woven sweater anyway because it won’t make a cozy blanket. So really, I wouldn’t worry about it! I’ve made many sweater blankets now and have included many sweaters that are cotton or acrylic without a problem. Of course it can’t hurt to back them if you are particularly concerned, but they will behave like a woven instead of like a knit, potentially making it a bit harder to sew all the squares together since they will then be a combination of knits and “wovens”. I’d recommend giving it a go without backing. I haven’t used a serger to make any of the blankets, just a wide zig-zag or a straight stretch stitch (sometimes called a lightning stitch). If you have a particularly loosely woven sweater in there are it looks like it ravels easily, go ahead and reinforce the seam with a second line of stitching. I lost my father last year and I plan to use a few of his cozy cable knit sweaters to do this. I’d like to add a hefty cozy something to the back to make both sides snuggly – do you have any suggestions? I have basically never sewn anything besides a gym bag in home ec – Am I crazy? Should I just send my sweaters to you and pay you to do this?? If you’re not feeling confident about your sewing abilities, perhaps you could have a friend help you? It’s a pretty simple project so you should be able to do it with just a bit of sewing experience and some self confidence. Feel free to ask me questions as you go. I wouldn’t recommend using a thick backing as the blanket will end up very heavy and likely too thick to sew through both layers. If you want the back to feel cozy as well you could use a very thin fleece or even a cotton double gauze. I’m going to do this for an assignment where l have to reuse items of clothing. i was wondering what the back of the blanket looked like and if l could just use a sheet for the back since l have to reuse items. A sheet for the back would work just fine. Sometimes sheets are very tightly woven, so I’d suggest making sure that you pick one that isn’t so that it doesn’t make it challenging to sew through. My mom recently passed away. She has many crazy holiday sweaters that are cotton/ acrylic that we’d like to turn into blankets for my sister and I. We don’t sew. Is there a way for us to send you the sweaters and pay to have you do them? We would need two blankets/throws made out of the sweaters we have. I’m so sorry for your loss. I’m not doing any custom sewing at the moment, but you are welcome to share my tutorial with with someone who does, and I’m happy to answer any questions you or they might have about the process. Hi, my mother recently passed away and saw your post and was wondering if you still did quilts/blankets out sweaters and how much you charged. I’m so sorry for your loss. I’m not doing custom sewing right now, sorry. Hi Erin, a quick question: I enjoy the soft ” unfelted ” feel of cashmere. Would, making a blanket with ” unfelted ” cashmere, work well? Unfelted cashmere will work with a few caveats. It will be harder to clean the blanket as you won’t be able to machine wash it. When you construct the blanket, you want to make sure that the cashmere won’t unravel while you are handling the cut pieces. Also, you will want to use extra sturdy stitching (e.g. two layers or a stretch stitch) so that your blanket doesn’t unravel with wear. I’ve never quilted before but would like to give this a try – do you have a recommendation for the size of the individual squares? I don’t have a specific recommendation for size. I tried to cut the largest squares/rectangles I could get out of the sweaters because it makes it faster and easier to sew together! Thank you so much for the directions on making a quilt out of sweaters. My daughter is having her first baby and wants me to make one for Ella (the baby) out of her sweaters. I was skeptical, but now am confident that I can make one after reading your instructions. After looking at your pictures, I assume that you do not quilt any designs in the middle of the blocks. I was also wondering what do you charge for making one? If this one turns out well enough, I would think about doing this for others that don’t sew. Thanks again for the instructions. That’s a very sweet idea to make a sweater blanket for a baby! I do not quilt anything in the middle of the blocks. I don’t have a price for making a blanket as I don’t do custom sewing. Like so many of your readers, I want to make a blanket from my Mother’s favourite sweaters. My sewing machine has 7 mm. wide decorative stitches, and I was wondering about joining pieces by fagotting overlapped edges, rather than making seam allowances at the back. If I was careful, I would not need to add the weight of a backing fabric. I guess I would have to bind raw outside edges in some way. What do you think the pros and cons if this might be? Thank you! Personally, I’m only familiar with fagoting delicate fabrics together – like lace and fine linen. I would be worried that the stitch wouldn’t be strong enough to hold together a blanket that will be used. Also, you would need to be sure that all of the sweaters you use are 100% wool and strongly felted so that they didn’t unravel at all as the fagoting stitch wouldn’t be enough to finish the edges. Generally, I’m all for giving experiments a go, but I have enough concerns about using the stitch that I would suggest making a blanket out of non-special sweaters first and then if it holds up to go ahead and use the sweaters that were your mom’s. Thank you for your advice. I think I will stick with your instructions! My mother was a lifetime knitter, very talented, Irish lady. She knit Irish fisherman sweaters, scarves, mittens, hats in sheep’s wool and a non -itchy “new wool” all bought or sent from Ireland by her sisters in addition to hundreds of other items. She started knitting at 4 yrs old and knit until a few weeks before dying of ovarian at almost 86 yrs old. I had an entire cedar chest full of her gifts just for myself and my daughter. I just recently had to get rid of the cedar chest due to downsizing, live in Az, so I have a pile of beautiful sweaters and blankets that I think would be perfect for your quilt project. I’ve been searching for ideas on how to preserve the beautiful work and honor her memories. Thank you for these instructions, now to find someone to talented enough to do the work. Her talent skipped a generation and none of her 4 daughters have any artistic abilities, although some of the grandchildren do. If anyone has a recommendation, please forward to me. Thanks for sharing the memories of your amazing grandmother! Memorializing her treasures in a blanket sounds like a wonderful idea. 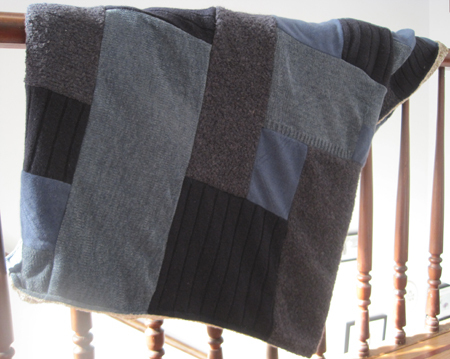 Hi, I want of make a blanket out of cashmere and was wondering if I need to use a ballpoint needle to sew the squares together and then switch to a heavier (denim) needle when I put the back on. I was thinking the heavy needle might make bigger holes in the knit and weaken the seams. Thoughts? Love the tutorial (and your blog), thank you! I’m not sure I can answer your question without more information. Cashmere is a fiber (like wool or cotton) so it can come in all sorts of weights. If you are using a delicate weight or weave, you might want to use a smaller needle to sew the squares together. If they were once sweaters, especially if you have felted them, you’re likely going to be just fine with a heavier needle for construction. Sorry I can’t be more exact, but I hope that helps. One way you can test is to sew a few sample seams with scraps of the fabric you are using and then throw them through the wash a couple of times. Look for wear on the seam. Do you not have a problem of the sweater parts unraveling when cut apart, before sewing to next block? How do you prevent that from happening? I recommend washing and drying the sweaters on high before cutting them to felt them as much as possible. If the sweaters are cotton or synthetic they won’t felt, but I don’t find raveling to be much of a problem because you don’t need to handle the cut sweaters much before sewing. You wouldn’t want to use a very lacy sweater in a blanket anyway. The edges may not be as crisp as the moment you cut them, but the raveling shouldn’t become problematic. I have a sewing machine…but I haven’t sewed on one for 35 yrs. My sister bought it for me thinking I would use it. I took the cover off of it and paniced. It’s so much fancier than I’ve ever used and tho I would love to create a simple quit or lap blanket I am scared!!!! Wondering if you have names and emailed to people that DO sew do I may contact them about doing something like this. Thanks!!! Sorry, I don’t have any names to recommend. If you’re familiar with sewing on a simple machine you don’t have to be scared by fancier machines. Just use the simple straight stitch that you’re used to and ignore all the fancier settings until you’ve built up a bit of confidence again! Best of luck! I see that this tutorial is a few years old and so are some of the comments, nevertheless it’s fantastic. For the last two Christmases I’ve been making mittens out of wool sweaters to give out as gifts to my family. Everyone has mittens….I need to make something else with old sweaters. I love the project because I’m reusing and recycling. I buy sweaters from a thrift store, wash them in hot water and dry them. People give me old sweaters also! I’m not sure about what a stretch stitch is. Do you stretch the material as you sew? So glad you find the tutorial helpful! A stretch stitch is any stitch on your machine that is designed for sewing fabrics that stretch. A zig-zag is the simplest example. If your sweaters are completely felted and don’t have any stretch left in them after washing them you can use a normal straight stitch. However if there is any stretch left in the sweaters you will want to use a stitch that will stretch with them instead of break if the seam stretches a bit.